FutureSchools ClassTech Conference Review. Day 2 Session 2 – Stop! It’s roundtable time! I have to be honest upfront. I have very mixed feelings about this particular session. There were some positives, and I did learn more than a few things, but overall, I have to say that the organisation and planning for this was abysmal and that it needs to be very differently next year. I attended two round tables and a breakout session, and whilst I did make some notes and there was some learning going on, for me, overall, and in conversation with a number of other people, many people are in agreement with me, I felt it was a shambles and close to being a waste of time. You may be thinking at this point that that sounds a bit harsh, and you would be correct, it does sound harsh. Unfortunately though, it is true. There were seventeen tables spread throughout a portion of the unused space on the expo floor, each clearly signed as to what number round table it was which allowed delegates to check the back of their the name badge in their lanyard and know which round table to go to for each of the three sessions. The two round tables that I went to, and from conversations with others, most of the other round tables were the same, were heavily oversubscribed. Consequently, when I arrived at my first roundtable (table ten, we have technology, now what? Using iPads for older students struggling with literacy, with Greg O’Connor), even though it was definitely the table I was supposed to be at, I was three rows from the back and struggled to hear anything. The expo hall is a cavernous, concrete floored, steel-beamed shed, and noise bounces around. That, combined with the large number of discussions going on, with all of the presenters trying to speak up so everyone at their table could hear, the susurrations of movements as people moved around the floor all combined to make it hard to hear. That would have been ok, if there wasn’t approximately thirty people crowded around the table, all trying to see what Greg was doing, meaning those at the back again, either missed out, or missed a lot of what was covered. A few tips I caught were that the ‘reader’ function on iPads/iPhones is also available as an extension on Chrome, produced by Evernote, called Clearly which removes distractions such as advertisements and menus, which for students with poor literacy can help them focus on what they need to be reading without the distractions of advertisements or sidebar menus. Greg also pointed out that we need to consider the reading age, not just of our students, but of the texts and materials that we are providing or recommending. He listed some tools to help with this including Simple Wikipedia, which takes Wikipedia pages and simplifies the language used. As an example, see the two screenshots below. This first screenshot is a portion of the regular Wikipedia page on Wormholes. This next screenshot is the entire entry for wormholes on the Simple Wikipedia site. Utilisation of Simple Wikipedia, which I had never heard of before, could be highly beneficial, especially for those students with low literacy levels, or English as a Second language, or even for students with no literacy issues in primary schools to help them with complicated concepts or ideas. Another app/extension recommend was the TL;DR extension for Chrome, which summarises web pages into more manageable paragraph sized chunks. He also recommended utilising image searches where possible to help with vocabulary instruction, particularly for ESL students, as the research shows (and this theme also came up in Ian Jukes’ Presentation) that comprehension is increased when we pair images with text. There is also a function within Google Search which allows you to search based on the reading age of the content. I’ve included a screenshot of this below. Clicking on the search tools button brings up the options based on country, time, reading level, or to clear filters. By selecting reading level, as I have, it then displays the percentage of sources against basic, intermediate or advanced reading level, and clicking on those levels then filters the results accordingly (As a side-note, I was surprised there were no entries against the advance option, given that I searched wormholes). Greg also said that leveraging the capabilities of Siri and predictive text in iOs devices can be useful. After the first round table, it was off to table number two, Minecraft: utilising student interests to empower accessibility to curriculum with Heath Wild. Heath spoke about the incorporation of Minecraft, as a common student interest, to foster engagement in learning and that the logical nature of Minecraft (I’m still trying to work out how to use it, so I can’t the logical nature at the moment) appeals to, and captures the attention of many students on the Autism spectrum. Heath spoke about needing to have obvious, verbal countdowns when it was approaching time to finish up, due to the immersive nature of the application and the flow that it generated. Minecraft can also be utilised to teach numeracy skills, particularly the four basic operations, and place value, due to the constant size of the various blocks that are used, and the range of different coloured blocks that can be used to represent the different place values. Heath said they use Paper, an iOs app to allow students to draw on their iPads and then took those drawings and created them within the Minecraft space as a method of allowing students to demonstrate their comprehension of texts as they could take screenshots of the worlds they created, which could be used for assessment purposes. 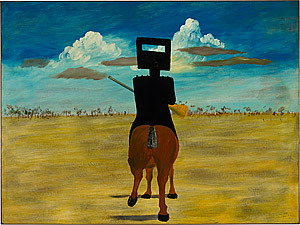 Heath also uses Brushstroke, an app allowing photos to be manipulated to appear as if they have been painted, and has used this for art studies, including the famous Ned Kelly artwork by Nolan. Students recreated this artwork in Minecraft, and then discussed how it’s feel and emotion would have been changed if Nolan had painted it as occurring at a different time of the day. Students put their Minecraft screenshot into Brushstrokes, manipulated it, and then imported them into Diptic to create class collages.Epic Zen Garden was leveraged to help students manage their emotions and to have strategies for dealing with stress and change. This concept was then taken into Minecraft, where students were encouraged to create their own Zen gardens, places where they could ‘go’ to feel calm when they are stressed, upset or angry. I was fortunate to snag a seat next to Heath for this particular round table, however, it, like the first one I was part of, was massively oversubscribed, and so many people were unable to hear Heath, especially those on the fringes, This was a massive negative to the whole experience, and the organisation structure of the round table session needs to be better dealt with for next year. The final session was labelled as a ‘breakout’ rather than a round table, and was actually in one of the rooms upstairs, and so was far more conducive to hearing the speaker. It was titled 40 students, 40 devices, one classroom, one teacher. How can a School make it work? and was lead by Philip Linscott. Having never been to a conference before, I committed a rookie error when deciding which events to go to during the roundtable session, and didn’t look to see who was presenting or where they were from. If I had, I would have realised that the session would not be, as I thought, a talk on strategies for leveraging devices in larger classrooms, but was in fact a sales pitch. Philip was from Lightspeed Systems, a company providing content-control systems to educational institutions. I have to admit, that a lot of what he said was rather interesting, but that it was not at all what I was expecting. It was, ultimately, a sales pitch, one which I could easily have received if I visited the company’s stall in the expo floor. Again, a lot of what he said was interesting, from the point of view of the level of control and accessibility their systems could provide to teachers, but it was not what I was looking for. I gained a lot from the roundtable session, not the least of which was to check who was presenting and where they were from so as to avoid the sales pitches, but I was disappointed at the seeming lack of organisation. All the round tables that I could see were oversubscribed, by two or three times the number of spots actually at the table, this combined with the din created by the combination of the number of voices, having to speak loud to be heard, and the echo-y nature of the expo hall made it difficult to hear. And many presenters either started early, or ran late, with the only indicator that time was up for each roundtable, a handheld bell that was rung by one of the organising staff members (in their delightful orange shirts!) as they walked around the expo floor…further adding to the noise levels. Anyone with noise sensitivities would have struggled. There is a large amount of space available in the area that Future Schools was booked. Even holding a series of the round tables in the hall/foyer of Bay eight at the venue would have helped, as the carpeted floor would have reduced the amount of noise being carried. There were other conference rooms that could have been utilised, some of them being capable of holding four or more roundtable sessions inside, spread out, in carpeted environments that would have helped reduce the din and create a more enjoyable experience for everyone. That session then took us to the lunch break, where I spent some time chatting with teachers from other schools, checking out various exhibitors’ stalls and, of course, having lunch. Tomorrow’s article will cover the presentations from session three of the day, Transmedia storytelling for education and Robotics across the curriculum. As always, thank you for reading, and please leave a comment. I’d love to hear from anyone who was either at FutureSchools, and your thoughts and suggestions on the roundtable session and how to improve it, or from anyone who has been to a conference with something similar, how it was organised there and what lessons FutureSchools may be able to learn from that. Posted on March 22, 2015 March 20, 2015 by Brendan MitchellPosted in EduTech, FutureSchools, MinecraftTagged 21st century learning, ClassTech, Digital Learner, education, EduTech, FutureSchools, Game Inspired Learning, Minecraft, pedagogy.